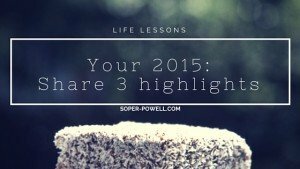 You are here: Home / life lessons / What are your top 3 highlights of 2015? Let’s get down to it. What are your top 3 highlights of 2015? We know it’s almost the end of (yet) another year. No doubt some of you are starting to look ahead to your goals and plans for 2016. But let’s stop for a second and just take stock of 2015. What have you done this year that you are proud of? C’mon. Wrack those brains. You can cheat if you want to. Take out the phone, fire up the laptop or reach for the diary and take a look back. What do you see in that rear view mirror? There were things you set out to achieve and you did it! There were things that derailed you. What was 2015 all about for you? I’m curious and I would love you to share. 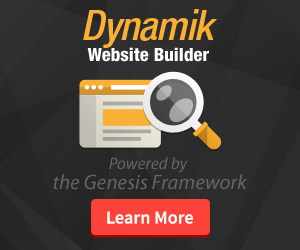 Maybe you started a new job – or better still, your own company? Or perhaps you got married, (or divorced). Did you have a baby or lose someone dear? “What doesn’t kill you makes you stronger!” Right? So what was it about 2015 you are grateful for? What were your highlights of 2015? I wager that once you start looking back, you will surprise yourself just how much you achieved. That’s the kind of person you are. This isn’t a bragging match – I just want you to take a few minutes to reflect. When I look back on 2015, this is what I see, that I’m most happy about and most grateful for. One of the advantages of my current role, is that I get to work with clients around the world. When we start projects, we travel to their country to meet them and kick off the project. Those trips are great. I don’t quite have the energy levels I had ten years ago and I prefer the trips spaced out. However, there’s still something exciting about visiting a country for the first time. The people (of course!) The culture. The sights, sounds, smells and tastes that assault your senses. Like the incessant car horns in Beirut. Or the segregation in society in Riyadh. The stunning day out in the mountains near Yerevan. The poverty in Algiers or the dust in Khartoum. The amazing hospitality in Tbilisi and the food in Istanbul. Each of the seven countries I visited for the first time in 2015 offered so much. Arriving at the hotel at 0430hrs in Tbilisi to find there was no reservation was perhaps the low-point but the response of the hotel receptionist really made up for it. I guess I could write a lot more about those trips. Let me know if you want me to and I’ll try to relive the experiences for you. In a previous post, I wrote about the things I learned going through the house-buying process for the first time. I still pinch myself. We finally did it. Ever since Trish and I met, we have made our home in rented accommodation. In fact, it’s been some 23 years I have been renting. When we did manage to part with Trish’s former home in the amazing High Peak of the Peak District National Park it was with much sadness. At the same time, it was the right thing to do. This marks a new chapter in both our lives. We are so happy here – and so is Nellie, our amazing 2 year old cat. Now she’s starting to master the cat flap – still takes her about 90 seconds to make up her mind she does in fact want to go outside and take that final step. And what didn’t I learn about DIY doing that job? Installing the cat flap. If you want tips, let me know. So the thing is, I’m 42 now. It took me a long time to finally muster sufficient funds together with Trish to be able to finally buy a place we really wanted. But it’s awesome, and amazing and strangely relaxing too. I know. I know! Now the real fun starts. At least just let me have my settling in period before you burst my bubble. As it its, the loft timbers were just treated against wood-boring beetle and I just learned the electric shower has to be replaced. But the thing is, it’s a project. That’s what we wanted. The previous owners loved this house – and now we can see why. Truly. We can feel it. And that is so rewarding. Perhaps the biggest personal achievement this year was setting aside time to invest in myself. What do I mean by that? Well, if you have been following the blog for a while, you know this content creation of mine only really started a couple of months back. For a long time, I’ve enjoyed writing but struggled with rhythm and focus. Although I am still refining my voice and niche, I am very happy to be writing consistently. Yes, I do receive some comments that my twin topics of self-improvement and customer experience can be a bit confused. I take that on board and I’m working on it. That said, I’m writing every single week, and I’m very proud of that. You my friend are amongst a growing band of readers too and I want to thank you for that! QUESTION: what would you rather I wrote about? Answers on an email please… or leave a comment below. So what does Andy Harrington have to do with all this? Well, he is ‘the’ authority on public speaking. Now some love Andy and what he stands for, others do not. What you can not deny is his success. I happen to really like what he teaches at the Public Speakers University (PSU) and through his membership body, the Professional Speakers Academy (PSA). I went through the PSU and joined the PSA in 2015. What a BRILLIANT decision and investment that has turned out to be. Not only am I now on the road to spreading my message to more people through blogging, speaking and such but I have met an awesome group of people and made a great number of new friends too. And let me tell you, it does not stop there! For those of you who know me well, you know of my broken relationship with my Mum. Just a couple of weeks ago, at the most recent 3-day PSA event I spent time surrounded by great people. During that weekend, I reached a new place on my personal journey. You see, I finally came to understand for myself what forgiveness is. As a result, I set about taking the first step to repair the relationship with Mum that weekend. I sent her an SMS message on the Sunday evening that will change the direction of our life together for the better as we head into 2016. That was no mean feat. So, it’s not just about what happens to you, it’s about what you do about it that really matters. So, enough about me! It’s now your turn. What are your highlights of 2015? I would love you to share 1, 2 or even better, 3 things about your year that stand out. Please leave a comment below or if you feel more comfortable, why not drop me an email? Finally, do please feel free to pass this along to a friend. Invite them to join the discussion. Let’s make the most of 2015 before it’s over and time to move on 2016!